The Denver Classroom Teachers Association (DCTA) and Denver Public Schools remained deadlocked Sunday after an attempt to reach a last-deal minute deal over teacher salaries ended with the union walking out of negotiations Saturday evening, kick-starting the first Denver teacher strike in 25 years. So how did we get here? DENVER — The Denver Classroom Teachers Association (DCTA) and Denver Public Schools remained deadlocked Sunday after an attempt to reach a last-deal minute deal over teacher salaries ended with the union walking out of negotiations Saturday evening, kick-starting the first Denver teacher strike in 25 years. Saturday's breakdown followed a failed attempt Friday to reach a consensus over the pay structure for the union's more than 5,000 educators. The district said Sunday its bargaining team would be back at work a day before the strike and invited union leadership to keep talking, though the DCTA said it would not attend Sunday's session after it balked at the district's latest offer and walked out of the bargaining session. By Sunday afternoon, the DCTA sent out a statement announcing educators would strike for the first time since 1994 on Monday, following 15 months of failed negotiations which have "failed to deliver a fair, transparent and professional salary plan that pays all teachers a living wage at the base level and limits unpredictable bonuses that disrupt our students’ education." In 1999, the Professional Compensation System for Teachers, or ProComp system, was introduced in Denver and quickly gained traction as pay for teachers was based on their performance rather than just their seniority or educational level. At first, both sides were eager about the bonus system, as the Denver Post reports. After 20 years, however, the DCTA and DPS don't see eye-to-eye when it comes to fair wages for educators. Tensions started heating up at the beginning of this year when negotiations between DCTA and DPS started going south. The lead DCTA negotiatior for Denver teachers, Rob Gould, said in mid-January that DPS did not appear to do enough to address teacher's concerns over pay. DTCA has argued that a teacher in Denver with 16 years of experience and a Master's degree makes about $65,000, compared to the $87,000 teachers make in Cherry Creek and $86,000 Boulder teachers make for the same level of experience and education. On Jan. 19, contract negotiations between DPS and DTCA failed as DPS sought to put $23 million into the teacher compensation proposal, differing from DCTA's proposal to put $27.5 million into teacher pay. At the time, teachers said a possible strike isn't just about salaries , but a social justice issue as more and more teachers quit to work in better-paying districts. As Denver teachers voted on a possible strike that weekend , DPS Superintendent Susana Cordova said there were certain places where the sides agreed, but also pointed out areas where the district is not willing to change its mind. The current proposal from DPS seeks to raise teacher salaries on average by 10 percent, but some teachers believe that is still not enough. On Jan. 22, an overwhelming majority of teachers in the state's largest school district voted to go on strike over what they say is inadequate compensation. Cordova immediately requested Gov. Jared Polis' help to intervene and help bring both sides to the negotiation table. The Denver Classroom Teacher's Association then asked the government not to intervene in the ongoing disagreement , saying state interventions "would be futile." Last Wednesday, Polis said the state would not intervene in contract negotiations between Denver Public Schools and the teachers union, hoping both sides will work through the weekend to come to an agreement, but in a tweet sent that afternoon , the DCTA said they would be striking "for our students." DPS officials said they would hold another round of last-minute negotiations as they "remain committed to reaching a resolution and views a strike to be not in the best interest of students," but union officials do not seem as confident. “Teachers were stunned when DPS proposed hiking incentives instead of putting that new money into base pay where it could make the entire district more competitive. We are incredibly disappointed that on the last day of bargaining and less than two days before a strike, they doubled down on one-time incentives teachers do not want, and the data shows do not work to keep teachers in their schools,” DCTA President Henry Roman said. “The bizarre proposal proves what we have said during this entire process, that DPS is not interested in listening to the concerns and needs of its teachers and special service providers. 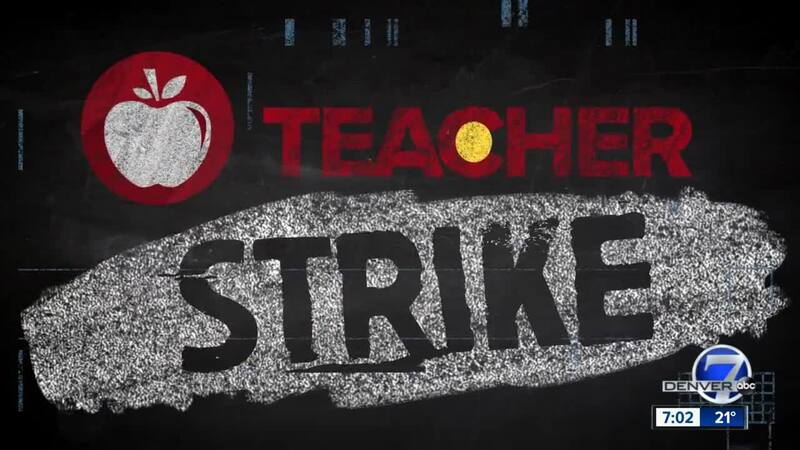 We will strike Monday for our students and for our profession, and perhaps then DPS will get the message and return to the bargaining table with a serious proposal aimed at solving the teacher turnover crisis in Denver,” Roman added. DPS said its Saturday offer would eliminate 150 positions in the district’s central office as well as performance bonuses for senior staff at the office, giving teachers and specialized-service providers $2 million more in base pay. The offer also included an increase in incentive pay for teachers in high-poverty areas. Following the abrupt end to Saturday's meeting, Cordova said she was “extremely disappointed” that union leaders walked out of the session. DCTA leadership did not take up the district’s request to negotiate on Sunday morning, saying the union was opting instead to prepare for Monday – making signs, educating teachers about the plans for the day, and taking some time to cool off after Saturday’s tense meeting. 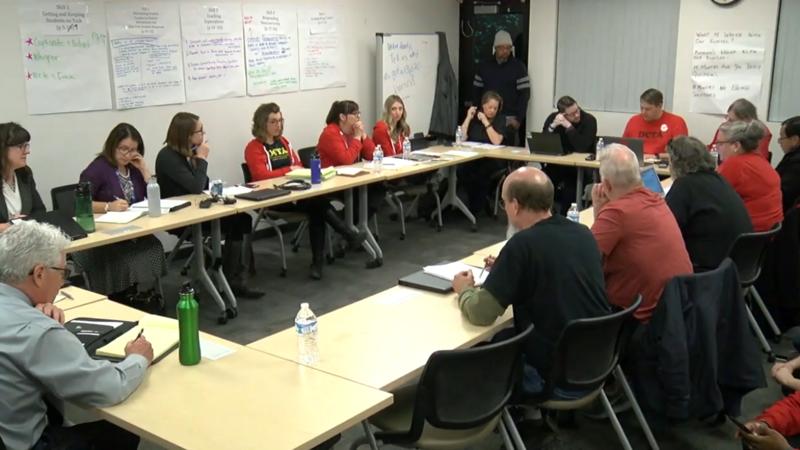 In a statement Sunday afternoon, DCTA spokesman Mike Wetzel said "both parties will take time to cool off" after a weekend full of heated discussion, adding they would come back together to discuss teacher compensation on Tuesday. Wetzel also wrote DCTA remains "committed to bargaining that will create the schools Denver students deserve."